Much mystery surrounds a new Twitter account which the “Who’s Who” of Doctor Who alumni are encouraging all and sundry to follow. @dayoftheFishDr is counting down to Doctor Who’s 50th Anniversary and rumour has it that the reveal will have something to do with Classic Series Doctors. Only time will tell! In the meantime, accept the recommendations of those below and follow @dayoftheFishDr. You’ve got nothing to loose! @dayoftheFishDr six days SIX is a goooood number…. 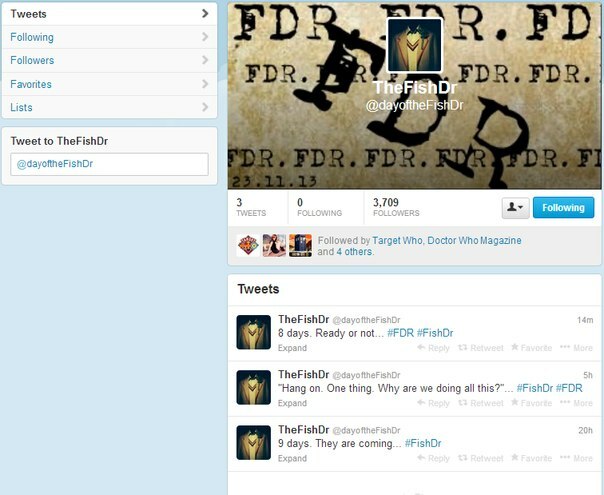 Curiouser and curiouser…are you following @dayoftheFishDr ? PSST! #FF @dayoftheFishDr 'cause REASONS.